The Sauna Fix - the highest quality and most affordable near infrared sauna in the market! There are many other wonderful benefits you'll gain from using the Sauna Fix system. Save energy! It helps you conserve energy by keeping 95% of sauna heat inside the tent, while also re-bombarding your body with optimal levels of healing near infrared light. Blood shunting! Near infrared sauna therapy is the exclusive method to experience blood shunting, an additional sauna benefit that doubles circulation effects. Blood shunting occurs when the side of the body under the lamp heats up, and the body shunts blood in the direction of the skin surface in response. The body's tissues become engorged with blood, and release water from the blood stream to help it cool, which generates sweat. Only near infrared sauna therapy encourages the user to constantly rotate from side to side, and therefore force the body to redirect the blood shunting back and forth. This consistent rotation also helps to avoid the skin from burning. Most effective healing! 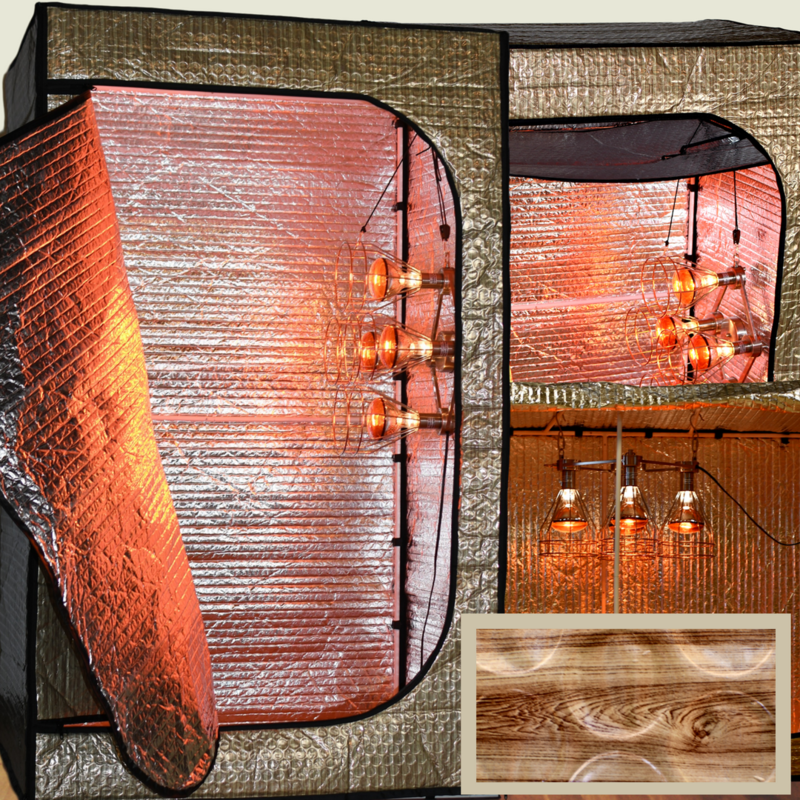 Use the Sauna Fix near infrared lamp with one of the available radiant tents to fully benefit from therapeutic effects of near infrared light and heat stress exposure. The panels of the tent are made from the following layers: nontoxic wood grain film, space blanket, large diameter bubble wrap, space blanket, and nontoxic film. Each tent powerfully retains the healing rays all inside the enclosure without escaping outside. Save time and money! Combining the Sauna Fix with a radiant tent removes the need to preheat, not to mention saves on construction costs. The Sauna Fix NIR portable tent sauna assembly requires no tools, no contractors, and no hassle. Safety guaranteed! The Sauna Fix fixture, radiant sauna tents, and all sauna accessories are CE and RoHS certified and lab tested to ensure user safety. Due to the highest medical-grade quality of all our products, the Sauna Fix lamp and radiant sauna tents do not outgas any toxic metals or harmful chemicals while being used. It is, unfortunately, not possible for a sauna to emit no EMF at all, due to the fact that anything with a power source must produce some amount of EMF. Please rest assured that we have taken all precautions to ensure that customers have as safe an experience as possible. Our test results prove the safety of the Sauna Fix system; something that no other sauna competitors provide. There also is no aluminum in the sockets of the light fixture. Please note that bulbs are not included with the purchase of the Sauna Fix. Click here to learn where you can purchase bulbs to operate it. Invest in the most effective sauna system to elevate your fitness, detox, and wellness journey! View all available sauna products, including the lamps, tents, bundles, and more, below.